After a opening raise, Mike Leah made it three bets preflop. Action folded around and the original raiser called. The flop came down and action checked to Leah, who bet. His opponent called. The turn was the and after a check, Leah bet again and was called. The river was the and action checked to Leah for a third time. He bet, but this time his opponent folded and Leah scooped the pot. For most of the day Allyn Shulman has been cruising well below the starting stack. She has finally picked up some chips after a recent hand. On the river, with the board showing Shulman was checked to. She bet and after taking some time to think over the hand, her opponent called. Shulman showed for the nut flush and that was good to take down the entire pot. While she has not quite moved back over the starting stack, she is starting to trend in the right direction. On a board of , action checked to Chino Rheem. He bet and was called by two other players. The turn was the and all three players checked. On the river, the player first to act bet. Rheem went into the tank and thought long before finally announcing a fold. The other player in the hand folded as well. Rheem hadn't released his cards into the muck yet. "I made a big fold," he said, showing for a flopped full house. The other player in the hand showed for a missed flush draw. The player who bet then turned up the showing she had quads. 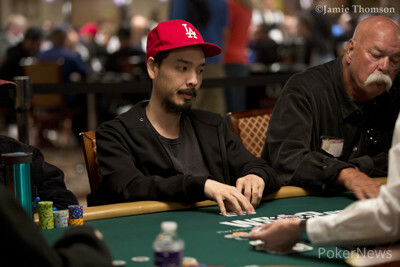 Rheem tapped the table, acknowledging he had folded correctly as he passed his chips to the player next to him. Players are now on their second 15-minute break of the day and will return soon. Jeff Madsen got all his chips in the middle before the flop against two other players, another who was also all in. The board ran out awarding the entire pot to the covering player with a Broadway straight and sending Madsen to the rail just before the second break of the day.